Here we see an image produced by truly ancient (ca 14 billions years old) microwave signals, emanating from every corner of the universe, based on events thought to have taken place ca 380,000 years after the Big Bang. The maps of Figure 11 are strangely analogous in that they too give an idea of the distant past by mapping evidence available in the present. Instead of the echo of distant microwave signals still detectable in space after billions of years, we have the echo of distant mutations, still detectable in our DNA after thousands of years. But the pictures are very different, in the first case relatively uniform, in the other radically disjunct. In fact the genetic maps are described as "The segregation of West Eurasian, East Eurasian and South Asian mtDNA pools." If the Out of Africa migration was a smooth progression along the "southern route," from the Horn of Africa to Southeast Asia and beyond, then this should be reflected in the genetic markers as a steady west-east cline. Unless the traces of the original migration, like those of the Big Bang, were obliterated by what happened at a later time. What happened during the course of the Big Bang, according to a theory now widely accepted, was cosmic inflation. What happened during the course of the great migration is unknown -- but it must have been something big, because it had a huge effect. We found that haplogroup M frequency drops abruptly from about 60% in India to about 5% in Iran, marking the western border of the haplogroup M distribution. A similarly sharp border cuts the distribution of Indian-specific mtDNA haplogroups to the east and to the north of the subcontinent. We therefore propose that the initial mtDNA pool established upon the peopling of South Asia has not been replaced but has rather been reshaped in situ by major demographic episodes in the past and garnished by relatively minor events of gene flow both from the West and the East during more recent chapters of the demographic history in the region (my emphasis). There is a significant difference between the discontinuity between the Middle East and the South Asian Peninsula and that between the Peninsula and its neighbors to the east and north. The ancient haplogroup M is hardly found at all to the west of Pakistan, while it is found in abundance in India, Southeast Asia and East Asia generally. Since the mainland of the Arabian Peninsula and neighboring Iran would have been uninhabitable desert at the time, we can safely assume either that no colonies were left in these regions during the Great Migration (GM) or that whatever colonies might have been left never survived. Thus the discontinuity so evident between Maps A and B can be attributed to the presence of a natural barrier. What we see in Map A must therefore be the result of migrations dating from a much later period. The very strange discontinuity illustrated in Maps B and C cannot be so easily accounted for, however. In this case, the same ancient root, haplogroup M, underlies the genetic picture for both regions; representing, no doubt, a faint echo of the original east-west migration (and in all likelihood confirming the southern route). But the M's found in India are not the same as the M's found to the east, southeast and north. Which is why Map B has a different color than Map C -- based on the fact that a very different set of haplogroups, M included, are "native to" each region. How can this be? Unlike the region to the west of Pakistan, there is no natural barrier that might hinder the colonization of territories bordering on, or beyond, India's eastern boundary. The authors wisely explain "that the initial mtDNA pool established upon the peopling of South Asia," i.e., the GM following the Out of Africa exodus, "has not been replaced." This is evident by the pervasiveness of certain ancient haplogroups, not only M but also N and R, in India. But their attempt to explain the discontinuities that so clearly overlay and obscure the traces of this early migration, on the basis of an mtDNA pool "reshaped in situ by major demographic episodes in the past," while reasonable, is inadequate. First of all, the clear demarcation we see between India and its closest neighbor to the east, Myanmar, is unlikely to have been produced by a series of unrelated events or migrations. It's hard to believe it could have been produced by more than one. And clearly it was not produced by a migration, since a migration would have resulted in continuity, not discontinuity. So it could only have been produced by an event, a disruptive event of major proportions. In relatively small and isolated groups (e.g. tribal groups) random genetic drift might seriously affect the haplogroup frequencies, which may become uninformative when a whole region (e.g. state) is considered . . . Therefore, the tribal data were excluded from the haplogroup isofrequency maps calculation. When illustrating the spread of mtDNA haplogroups native to West Eurasia, East Eurasia and India (Figure 11, panel D) we present these data as pie diagrams. The respective sample size and origin are indicated adjacent to the diagrams. The effect of the tribal data on maps A, B and C may, to some extent, be inferred from the pie charts in map D. And, indeed, the picture they present, of a major division between South and Southeast Asia, is consistent with what we see in the maps above. Not sure what you're doing with this map, really. The authors decided to classify certain haplogroups from where they are more common of three pre-defined regions and logically they ended up with three regions. The only purpose of those maps is to illustrate (better or worse) the borders and gradations between these three more or less homogeneous world regions. It can of course: M6 is SA, M7 is EA, M4 is SA and M8 is EA... and so on. It's a circular reasoning what you're doing here: the regions appear because they are pre-defined as such regions (with some logic of course but that premise accounts for the resulting maps in any case). We could do similar maps in Europe, would be a little blurrier but would show regional differences too. For instance if we want to define Eastern and Western Europe (something "natural" based on stuff like blood groups or Y-DNA), we would take each subclade of H and U and assign them a value on where they are more frequent, so H1 or U8 would be West but U5 or H8 would be East. We'd end with a bicolor map cutting Europe around the Elbe for sure. Of course this does not exclude other possible combinations too. Maju: "It's a circular reasoning what you're doing here: the regions appear because they are pre-defined as such regions"
Not according to the authors: "A similarly sharp border cuts the distribution of Indian-specific mtDNA haplogroups to the east and to the north of the subcontinent." If this were simply an artifact of their methodology, why don't they mention that? Instead they go to the trouble of mapping this "segregation" and then attempt to explain it: "We therefore propose that the initial mtDNA pool established upon the peopling of South Asia has not been replaced but has rather been reshaped in situ by major demographic episodes in the past." Sure, it's true that we find M in both India and East Asia, but Cordaux et al already argued that M in India was different from M to the east of it. And this study confirms that difference, noting a "sharp border between the two regions." I remember that you dismissed Cordaux's work, but sorry, when both Cordaux AND Endicott, who publicly disagreed on other aspects of this evidence, are in agreement on this, I find that meaningful. There is also the matter of the distribution of M in India, which, as the authors report, has a distinct cline toward the southeast. So even on the basis of M alone, we see the beginnings of an east-west divide. N derived haplogroups, on the other hand are much rarer in this region than in west and central India -- as noted by Oppenheimer. Are you saying that our ancestors already knew about political boundaries that were not to be established until tens of thousands of years later? There is no natural boundary, so what exactly are you talking about? I may have gone a little far here in my criticism, Doc. Certainly the West Eurasian/Tropical African mtDNA boundary must be less "strict". It is the tightness of that division what you and the authors want to emphasize, right? That is indeed that way. What once was a corridor later became a barrier. How? I presume that by mere demic pressure along a rugged border. Whatever crossed that border was normally absorbed and "drifted out" by the sheer numbers of the adoptive population at the other side. I may be wrong but certainly there must have been some mechanism impeding or at least minimizing demic flow between South and East Asia. But it's again a circular definition. It's meaningless! M in India is also different than M in India. And no: there is no error in the previous sentence. Each basal lineage is different from all the others: each lineage implies some sort of founder effect (larger or smaller). Whatever the origins of M as a whole, M1, M2, M3, M7, M8, etc... each mean a peculiar founder effect, maybe later intermingled with others who also rooted nearby or not (if they rooted in an isolated manner). Actually, if we consider only M, we also see a sharp boundary between South Asia and West Eurasia (plus African extension): M1 is not found in South Asia, just like M8, M7 and all the East Asian lineages are not either. Only some N lineages transcend the South Asia/West Eurasia border and these in some cases are also the ones transcending the South/East Asia border too. This means in my opinion that N starred a secondary migration westward, leaving some lineages split at both sides of the Hindu-Kush border in the process (R and its derivative U, N2 and N1'5). N derived haplogroups, on the other hand are much rarer in this region than in west and central India -- as noted by Oppenheimer. Actually N-derived haplogroups are also rather frequent in Southern India, specially R-derived ones. But, sure, it's possible that R and other N-derived Western clades stopped by and coalesced in NW South Asia. Not 100% clear anyhow in my eyes but a reasonable possibility. There are natural boundaries between these three regions. Bengal is a swampy narrrowing, followed to the east by very rugged and surely densely forested lands. Passable but not the kind of open grassland "highway" that I suggested for Sahel or East africa, or even Siberia maybe. To the West there are also mountains and deserts. The Himalaya is of course an "absolute barrier", at least for Paleolithic conditions. These world region borders are quite natural. Maju: "I may be wrong but certainly there must have been some mechanism impeding or at least minimizing demic flow between South and East Asia." If demic flow had been impeded for any significant amount of time, then wouldn't M and N in East Asia be derived from M and N in India? Is that the case? As I understand it, no, but maybe I'm missing something. Maju: "Each basal lineage is different from all the others: each lineage implies some sort of founder effect (larger or smaller)." If that were the case, then what do you suppose is the basis for the "sharp border" that "cuts the distribution of Indian-specific mtDNA haplogroups to the east and to the north of the subcontinent"? Again, if this were an artifact of the methodology they'd have mentioned that, I'm sure. Possibly what they're referring to is the importance of N along with M in East Asia, and its absence in East India. What do you think was on their mind when they came to this conclusion? Are they confused? "There are natural boundaries between these three regions. Bengal is a swampy narrrowing, followed to the east by very rugged and surely densely forested lands." I imagine there would have been many places along the southern route that would have contained similar barriers. Which is why it seems logical to conclude that they were using water craft for at least some of the time. And if they had water craft capable of maneuvering near the coast, then swamps and densely forested lands would not have been a barrier. But even assuming a barrier that held them back for a significant amount of time, wouldn't that have produced a significant bottleneck (founder effect) in Southeast Asia? Is there any sign of that? No to the first question and no to the second question. As I understand it, the demic flow eastward happened at the earliest M stage, with the colonists settling east of Bengal being of the same batch as those settling in South Asia. Hence all M lineages are local (except those that have experienced some late expansion like M8>CZ or D, typically though North Asia and America). Would it be for M alone, that would be it: one single expansion (explosion) with many many distinct local founder effects (and maybe some localized secondary expansions). - Australia: 4 (N12, N13, N14, S) - but some might be related in fact? - South Asia and West Eurasia: 4 (N1'5, N2, X, R). [R is scattered but has greatest basal diversity by far in South Asia. X is only found in West Eurasia, Altai and America but has greatest basal diversity in West Eurasia, Levant probably. N1'N5 and N2 are basally split into a larger West Eurasian and a smaller South Asian lineage]. This weights quite clearly in favor of N having a SE Asian urheimat. However there is no pre-N anywhere, so we know nothing of how N arrived there to begin with. 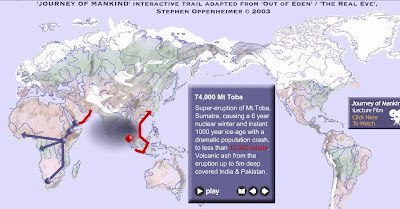 Most seem to believe it just participated in or even spearheaded the M expansion into the East (founder effect) but there are a few who claim a Northern route via Siberia and then there is also the Oppenheimer school of Toba catastrophe. Whatever the case N seems to have expanded to South Asia among other places and there, a subclade, R, expanded again in an explosive (star-like) manner (16 basal sublineages) in all directions, reaching to Papua and, another branch, eventually to America. After the R expansion the South Asia-East Asia (in either direction) flow seems to have stopped. But only then. So it's not BEFORE the main Eurasian expansion when that happened but AFTER it, more or less when the expansive drive in the Eurasian continent began to head towards more difficult areas: West Eurasia (Neanderthal competition, aridity) and NE Asia (extreme cold). 1. Main Eurasian expansion (at the M, N and R basal phylogenetic levels mostly). 2. Secondary expansions into West Eurasia and NE Asia (Siberia), overlapping with the last part of phase 1. Phase 1 can be subdivided in (a) M super-explosion (urheimat: South Asia), (b) N explosion (urheimat: SE Asia) and (c) R explosion (urheimat: South Asia again). However the order of a and b is not totally clear, as they are sibling clades and is this what causes confusion. If that were the case, then what do you suppose is the basis for the "sharp border" that "cuts the distribution of Indian-specific mtDNA haplogroups to the east and to the north of the subcontinent"?. In my opinion nothing but demic pressure. South and East Asia (and Sahul) were colonized almost at the same time, so as soon as the "containers" were full, people looking for new virgin lands to settle either did not find them or had to go to less attractive areas, as were West Eurasia and Siberia. I do detect that pattern very clearly. However at least R managed to expand over (or near to) some older groups in East Asia and New Guinea (and to a lesser extent also in South Asia), so I presume they had some technological or socio-cultural advantage (not sure which one though). Again, if this were an artifact of the methodology they'd have mentioned that, I'm sure. The paper says what it says: that East Asian and South Asian mtDNA haplogroups overlap very little. But that's it. There is nothing but geography that makes these lineages distinct sets. It's apples and oranges mixed but separated in two distinct baskets. The baskets are indeed very old and the various apples and oranges in each of the two baskets has been there for at least 50,000 years. But phylogenetically apples (M) are still apples and oranges (N) are still oranges. Possibly what they're referring to is the importance of N along with M in East Asia, and its absence in East India. N is not absent in India. It's just less important in comparison (by mere raw numbers - see previous post for basal lineages count, which is very similar). What do you think was on their mind when they came to this conclusion? Are they confused?. I have to re-read the paper and then I'll tell you. But what I gather from the maps is just that the demic border between South and East Asia is older (and hence better defined - in absence of "recent" major migrations) than the one between South Asia and West Eurasia. I imagine there would have been many places along the southern route that would have contained similar barriers. Probably only at the level of the Kraa isthmus or the Indonesian straits. The Kraa border has been blurred a lot by Austronesian expansion but if we consider only Negritos, there is a similar border indeed, or rather several (as Orang Asli and Andamanese are similarly apart - and probably Filipino Negritos are yet another distinct group). And yet more borders to the SE, with Melanesians and Australian Aborigines making non-overlapping clusters of their own (though Melanesians and Australian Aborigines do share some haplogroups but not the bulk of them). East Asia north of Kraa does not have that kind of internal borders, not even if we include America. And indeed there are not such isthmuses or straits, much less Himalayas, either making natural borders within either East Asia or South Asia. Which is why it seems logical to conclude that they were using water craft for at least some of the time. And if they had water craft capable of maneuvering near the coast, then swamps and densely forested lands would not have been a barrier. Watercraft would not have anything to do in the jungle hill country. And anyhow the barrier does not need to be absolute (otherwise colonization would not have happened at all) just enough to allow a dense population here (Bengal) and only a sparse one there (Assam). That's enough to prevent Assamese from invading Bengal with raw numbers. Assam (loosely speaking) would be hence a buffer area between the two world regions, with people from both migrating there now and then but always in too small numbers to make anything of an impact at the other side. For me it's quite simple. But even assuming a barrier that held them back for a significant amount of time, wouldn't that have produced a significant bottleneck (founder effect) in Southeast Asia? Is there any sign of that?. That's why of the theory of rapid coastal migration. Coastal boating would have allowed rapid expansion in absence of any other population as they advanced. For some time, people had so many prime virgin lands to go that "voting with their feet" or probably with "their boats" was so extremely easy that people expanded very very fast. Whatever the exact pattern at the beginning there were no populations that posed any barrier. Later they did. However, as I mentioned in my previous post, there was at least one secondary migration that managed to overcome that obstacle, the expansion starred by mtDNA R. This for me means that this secondary expansion happened probably at a transition moment, when there were still enough empty lands to settle, specially in East Asia (where the lineages leading to F and B were quite successful) and in New Guinea (P) but when the demic pressure was beginning to be noticeable enough as to make the journey to West Eurasia really worth it. I hope you can at least understand what I see. Some aspects are of course open to interpretation but the general lines of what I'm saying probably not. Maju, your last few posts are extremely interesting and informative. Thanks. There are nevertheless many things that puzzle me about your interpretation of the data, but I don't know if this is the best place to get into all these issues. Have you covered this theory in your own blog? And if not, maybe it would be a good idea to do so. Maju: "As I understand it, the demic flow eastward happened at the earliest M stage, with the colonists settling east of Bengal being of the same batch as those settling in South Asia." I see this too. The first stage seems to have been a fairly quick run across the full extent of the southern route. But it seems likely that this would have left settlements along the way that would still have retained their African morphology and culture, regardless of whether they would originally have been L3, M or N genetically. And by the way, it doesn't seem likely that this original lineage could have been L3, even if we assume a Toba scenario. Because that would have left L3 survivors east and south of the Toba plume, which we have not found. So, if we want to assume a single exodus at a single time and place, do we have to assume that this population would have been divided into two groups (moieties? ), one M and one N? "This weights quite clearly in favor of N having a SE Asian urheimat." Very interesting. I hadn't considered that possibility. How could it have originated in SE Asia if it had been along for the ride from the start, in Africa? Could the earlier manifestations of N have been wiped out by Toba? "Watercraft would not have anything to do in the jungle hill country." No, but they could have been effective in the coastal migrations, enabling the migrants to bypass natural barriers on land. However, as you say, once the entire coast had been populated, these populations would have been a barrier to any group attempting a back migration. Especially since HMC would most likely still be maintaining non-violent traditions, at least prior to the Toba event (or in its absence). But if Toba had devastated South Asia, such a back migration would have been very easy, no? "And anyhow the barrier does not need to be absolute (otherwise colonization would not have happened at all) just enough to allow a dense population here (Bengal) and only a sparse one there (Assam)." Interesting. Is there any way to test such a hypothesis? Yes, I have dwelt on this matter in several posts, mostly exercises to make my own self understand better the dynamics of the Out of Africa and Eurasian expansion processes. I hate to rely only on academic opinions and needed to clarify it all. 2. Phylogenetic mtDNA tree built with proportion to mutations at each node, base for the other work. However I now recognize some errors in the location of some lineages, notably minor N subclades N2a (wrongly placed in Australia, it's South Asian in fact) and N21 and N22 (wrongly placed in South Asia when they are in fact from SE Asia, I think). It's not easy to find where these minor lineages are found, so guess it's excusable, but still, they are errors. There might be some other minor errors that nobody has detected so far but the essential lines are there. Check also under tag Eurasia, as most post dealing with these matters are tagged that way (also mtDNA, Y-DNA, Out of Africa, Paleolithic, genetics, etc.). The creation of PhyloTree was in any case of great help in improving my understanding (and that of others for what I know) of the mtDNA phylogeny, because, unlike Y-DNA, there was no quasi-official reference site for mtDNA before that and was a total mess, very specially for the amateur trying to get things straight (like you or me, for instance) but maybe even for the professional geneticist, I'd dare say. One issue that may be tricky in the first linked article, is that I used a simple mutation count without further concerns. This is approximate but probably does not meet academic standards. Another issue is that I treated all mutations the same, I want to do a remake of the same exercise in the future but counting only coding region mutations, which I understand are more reliable references. Whatever the case, as I mentioned in a previous comment (with due link), different extant lineages have indeed different number of mutations and there is no way to overcome this real fact. Probably geneticists use averaging methods but I haven't so far been able to do that with mtDNA because of the sheer number of the lineages involved and my limited means. Whatever the case, even the best age estimate (check also label "molecular clock") can only be an approximation. I tend to distrust them in general. I'd rather not discuss the cultural matter because you already had a very hostile reaction to my tentative alternative explanations before and anyhow I have already exposed my latest viewpoint in past threads (i.e. the gap could be more gradual and less radical, loss of P/B could be related to high population densities or whatever other hard-to-grasp reason other than Toba). And by the way, it doesn't seem likely that this original lineage could have been L3, even if we assume a Toba scenario. Because that would have left L3 survivors east and south of the Toba plume, which we have not found. Like I always say to German: M and N are all the L3 we have in Eurasia (AFAIK). There are other five basal lineages but all are in Africa. The only other possible lineage involved in the OoA episode (surviving as of now) might be L6 (found at low frequencies in Yemen and Semitic groups of Ethiopia only) but it could also be the product of a second migration. Very interesting. I hadn't considered that possibility. How could it have originated in SE Asia if it had been along for the ride from the start, in Africa? Could the earlier manifestations of N have been wiped out by Toba?. One possibility is of course that our knowledge is still imperfect and we are missing some important diversity, maybe in India. Another possibility is that N arrived "late" to South Asia and was simply "drifted out" (extinct by mere drift) there because of being a extremely small minority but found a place to thrive in or around SE Asia instead. It's also possible that Toba helped to erase the pre-N and pre-M diversity, along with regular drift. And there are also those that suggest a "northern route" through Siberia at extremely low densities that have left no trace for that very reason (though I make no sense of this being in any way related to Australia). In some discussions I have offered the UFO hypothesis (of course as a joke): we just don't know the exact process, for what I can tell it's perfectly possible that a UFO abducted the pre-N carriers in West Africa and deposited them in Thailand or wherever. In practical terms it means that the pre-N trail was so thin that was easily erased by whatever reasons. This probably also applies to Y-DNA C and D, similarly centered in SE Asia. But if Toba had devastated South Asia, such a back migration would have been very easy, no?. I presume so (unless it also devastated other areas, even if not just with ash but with cold and related mass extinctions). That's precisely a reason why I find extremely difficult to accept Oppenheimer's hypothesis because the rule of basal diversity supports a South Asian and not so much SE Asian urheimat for the main Eurasian expansion (mtDNA M and Y-DNA F particularly, maybe also mtDNA R). To make this fact fit in Oppenheimer's hypothesis M and F would have got to expand from SE Asia and, sorry, but I don't see how the evidence could support it (nor how would it help to explain your gap either). Is there any way to test such a hypothesis?. I don't know. What I see is that your deary map C shows that. Assam, or NE India in general, mostly belongs to Eastern Asia genetically (but somewhat mixed) but they have never been able to make much inroads into India proper, excepting the likely Neolithic arrival of Austroasiatic speakers (Munda), who probably benefited of their mastery of rice agriculture and who anyhow only had a significative impact in the Y-DNA (haplogroup O). Guess you could create a computer simulation but that's beyond what I can do. "Like I always say to German: M and N are all the L3 we have in Eurasia (AFAIK). There are other five basal lineages but all are in Africa. The only other possible lineage involved in the OoA episode (surviving as of now) might be L6 (found at low frequencies in Yemen and Semitic groups of Ethiopia only) but it could also be the product of a second migration." Although I think my conversations with Victor are in an insolvable impasse, I did notice that my name keeps coming up in your exchanges. M and N are part of L only in erroneous phylogenies broadcast by geneticists. No pre-M and pre-N L lineages have ever been detected. There're no African L lineages outside of Africa, either in ancient remains or at low frequencies in marginal populations. L6 is found outside of Africa but not in Africa suggesting its non-African origin. These are facts. In reality, in the same way as Europe (almost) only has R (off of N), Africa only has L (off of M). Let's wait until geneticists get the mutation order right. (Only in their wild imagination, the Pygmies and the Bantu could split 60K years ago. In reality, it happened no earlier than 10K, when the diversification within Pygmy-specific clades began.) In the meantime, Luis, don't force Victor to take a hypothesis for a fact. He doesn't like it. "(a) M super-explosion (urheimat: South Asia)"
It's unlikely that M originated in South Asia as the basal phylogenetic split between M and D lineages within macrohaplogroup M (see Phylotree) is better represented in (North)East Asia. So both macrohaplogroup M and macrohaplogroup N have their "urheimat" in East Asia broadly conceived (at least as far as the Old World is concerned). I did notice that my name keeps coming up in your exchanges. So when I see that Victor suddenly makes a claim that I have read from you before, I can't but name it. L6 is found outside of Africa but not in Africa suggesting its non-African origin. Actually it's a very interesting clade because it's only been located in Yemenis and Semitic Ethiopians, at very low levels and with similar diversity at both sides of the strait. L6, as you may know, is part of the L3'4'6 lineage that also includes (yes, it does) M and N. So hypothetically it might be a remnant of the OoA migration process. However, L6 is an early offshoot of this macro-haplogroup, which no doubt was located at or around the Horn of Africa. The next branch of L3'4'6 is L4, which is clearly African, being found again at The Horn, East Africa and among the click-speaker nations of Tanzania: Hadza (63-80%), Sandawe (48%). And then comes the most important branch, L3, with five basal sublineages in Africa and two (M, N) in Eurasia. So when we talk of this L3'4'6 haplogroup is not too different (slightly older) as when we talk of L3 alone. L6 therefore might be a small remnant of the coastal migration or whatever other process of genesis for the Eurasian subset of Humankind. All the rest is just your repetitive self-complacent nonsense. German: what you say about M and D is trivial. D is just one of c. 40 M sublineages, of which many (but not most), like D, have only an Eastern Asian (and by extension in some cases Siberian and American) distribution. D is only a tiny corner of the M picture. Thanks for the references to some very interesting posts in your blog. I'll be responding in more detail when I get some free time. "If mtDNA L3 expanded at that remote time, in my opinion, mtDNA M and N would have expanded right after the Toba event, which surely caused a major bottleneck in Asia." This surprises me, as recently you've been dismissing talk about a Toba bottleneck as some sort of delusion. Have you changed your mind about Toba? And if so, why? Doc: my thought evolves and, as I have said before, I have not everything too clear. My main warning is against taking too many things for granted, specially when they are very unclear. Against putting all the eggs in one basket when there are many doubts about the quality of all the baskets. The context of that snippet is that I flirted then (and also do now) with the idea the OoA happened c. 100,000 BP (some time between 130 and 90,000 BP). In which case Toba would have caused a bottleneck of sorts, erasing part of the early Eurasian diversity. Example 1: the OoA-Toba (L3-M) span has a value of 3, while Toba-near present span would be of 11-15 (measured between M and some random D sublineages). That means that we "are" now 25,000 or 50,000 years into the future. Example 2: the OoA-Toba (L3-N) span has a value of 5, while Toba-near present span would be of 19-21 (N to random K sublineages). Similar odd proportion. Also I used the apparently oldest West Eurasian haplogroups (dated c. 40 Ky ago, though could be as old as 50 Ky) to calibrate and did not get too valid answers either. And also compare with L3 to root: 20 coding region mutations! In comparison the L3 to N and M period must have been small... unless you want to push "Eve" to c. 250,000 years ago (at least). I had to reconsider and accept that the "late" coastal migration theory could have better grounds than I thought. However there may be some artifact in all that reasoning, so I don't exclude it either totally. There is a growing number of scattered archaeological evidence that could suggest an OoA of more than 100 Ky ago. However none is too conclusive and, out of North Africa and Palestine, there is no Homo sapiens skeletal remain so extremely old (Liujiang skull would be post-Toba even by the oldest dates. 1. M and N look like the right apportion of L3 to be founder effects in Eurasia at the OoA. In fact even a single lineage would make sense, considering that L3 does not have so many basal branches (seven plus maybe some "asterisk" others) and that migrations tend to produce those founder effects by default. 2. The main expansion drive appears anyhow located at South Asia, what seems unlikely in a Toba scenario of destruction in the subcontinent. "Actually it's a very interesting clade because it's only been located in Yemenis and Semitic Ethiopians, at very low levels and with similar diversity at both sides of the strait." What I have is this: "Newly defined clade L6, the most frequent haplogroup in Yemenis, showed no close matches among 3,000 African samples." (Kivisild et al. 2004). Same in Abu-Amero 2009 ("a newly defined clade L6 in Yemenis, with no close matches in the extant African populations"). Unless you show me a source for your assertions about Ethiopian L6 (beyond L6), all of your subsequent paragraphs are useless. So when I see that Victor suddenly makes a claim that I have read from you before, I can't but name it." Victor quoted Batini and Quintana-Murci. "German: what you say about M and D is trivial. D is just one of c. 40 M sublineages, of which many (but not most), like D, have only an Eastern Asian (and by extension in some cases Siberian and American) distribution. D is only a tiny corner of the M picture." But the most important one. Check Phylotree and you'll see that D (defined by 4883 and 5178A) is an outgroup to all M lineages, East Asian, South Asian or African-West Asian. "All the rest is just your repetitive self-complacent nonsense." Get a degree first. And you're forcing me to be repetitive because you don't get simple facts right away. Erratum: "Ethiopian L6 (beyond L6)" should read "Ethiopian L6 (beyond Wikipedia)." One more thing: this "tiny corner", together with another "tiny corner", namely haplogroup C, have the widest geographic distribution out of all clades of macrohaplogroup M (from the Saami in northern Europe, a couple of Caucasus populations in the west and the Chenchu in India, all over East Asia and all the way down to Tierra del Fuego). This is a signature of a very old expansion. All other clades of macrohaplogroup M (they should call it macrohaplogroup D instead) are much more localized. Unless you show me a source for your assertions about Ethiopian L6 (beyond L6), all of your subsequent paragraphs are useless. Seems it's mentioned at least in some paper by Torroni. Cf. 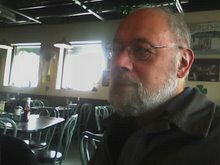 Ian Logan's mtDNA L6. Whatever the case the location of this rare haplogroup is around the Bab-el-Manded area. That they chose to dedicate a separate page to it does not mean it is "an outgroup" (what a ridiculous idea!). It's just one of the many dozens of M basal subclades. As you seem to evidence, a degree does not make you automatically smarter, nor wiser nor honest with oneself. Wide expansion is not the same as old expansion. I'd agree in principle that D is probably among the pioneer lineages in NE Asia (i.e. North of Beijing - though not sure how its presence in India and Caucasus may alter this picture) but doesn't look particularly older than other many M basal sublineages. C is a subclade of CZ and this one of M8, so it's not even basal re. M. It has a relatively large count of mutations separating it from the M node and that means to my eyes that it represents a second wave that I estimate c. 40 Kya, more or less coincident with the colonization of West Eurasia in what, to my eyes, looks like a period of demic change, with the earliest regions of colonization (South and East Asia specially) already pretty much saturated, forcing pioneering groups to look at new, more challenging, frontiers, in this case Siberia. Whatever the case D and M8 are only two basal sublineages of the almost 40 that M sports. D and CZ show clear signs of specialized ecological (cultural) adaptation to the cold North but that's about it. "a degree does not make you automatically smarter, nor wiser nor honest with oneself." No, nothing does. What you do develop, is a good judgment. And you desperately need it. "Seems it's mentioned at least in some paper by Torroni. Cf. Ian Logan's mtDNA L6. Whatever the case the location of this rare haplogroup is around the Bab-el-Manded area." I checked the site and the attached tree shows U6 and not L6. So, I assume he misspelled U6 as L6. Who's Ian Logan? Another home-grown savant? The only L lineage detected outside of Africa is not found in Africa. That's the most important thing. "C is a subclade of CZ and this one of M8, so it's not even basal re. M. It has a relatively large count of mutations separating it from the M node and that means to my eyes that it represents a second wave that I estimate c. 40 Kya, more or less coincident with the colonization of West Eurasia in what, to my eyes, looks like a period of demic change, with the earliest regions of colonization (South and East Asia specially) already pretty much saturated, forcing pioneering groups to look at new, more challenging, frontiers, in this case Siberia. Whatever the case D and M8 are only two basal sublineages of the almost 40 that M sports. D and CZ show clear signs of specialized ecological (cultural) adaptation to the cold North but that's about it." In principle I like this kind of discussions. A rare occasion of thoughtfulness on your part. However, I don't agree with your perspective. If you believe that D and CZ are adaptations to cold environment, then Africa L is adaptation to African hot environment. You have to be consistent. Moreover, C and D are most common lineages in South America, which is rather warm by my Russian standards. C and D are very close in their distribution: they're both found in India, among the Saami, in the Caucasus and in numerous American Indian tribes. M8 is a highly localized lineage (mostly Japan), which makes it likely that the mutational structure is messed up here. I don't believe in diversity measures as a sign of age. It's one component out of a bundle that includes geographic span and frequency (you can call these two "stability measures"). Macrohaplogroup M can have all these basal diversity but what stands out are the two lineages (C and D) with the largest geographic span of all and high frequencies in a large group of populations. The rest are later derivatives driven by bottlenecks and re-expansions driven by demographic growth. Yes, the trees are messy and obsolete, as he admits in the main page. However for too long that site was the only minimally comprehensive online reference for mtDNA research. The regular pages are being updated regularly and the site remains a decent quick reference (but, sure, doublecheck all you need). I have seen the reference for Ethiopian L6 elsewhere but my direct source (a forum) is dead now, so I cannot check the reference. Why don't you move your arse instead of being so unwarrantedly critical and search for the Torroni reference yourself? What you do develop, is a good judgment. Again your example shows it's not necessarily the case. A degree is just a certificate that you have successfully completed certain studies. And, as far as I know, you have no degree on genetics nor any other related discipline such as biology. So in this aspect at least we are at the same level by certificate (though obviously I know more on the subject, have a much better understanding and insight and, crucially, I'm not obsessed by some crazy pet theory that blinds my judgment). I'm way too familiar with people who seem to think that a degree in engineering, for example, would allow them somehow magically to be experts in whatever they want. That's not the case: engineers do not need to know anything about, say, medicine or history. I know even historians who know much less history (not to mention prehistory) than I do. Similarly you (and me and everybody) are limited in your knowledge and you should be able to realize it if you wish to do something of worth in your life. Get me right in this: not the haplogroups as such but the culture of the people who carried them through Siberia and Beringia... and eventually into all America. Similar cases can be done for other North Eurasian lineages such as Y-DNA Q, N and C3, or mtDNA A.
I don't believe in diversity measures as a sign of age. Basal diversity and intra-haplogroup diversity in general is the best indicator we have to pinpoint a likely origin for each lineage. It's not 100% safe but it's a very good indicator in any case. It's not "age" what measures anyhow. Not directly at least. Torroni and Behar never found any L6 in Ethiopia. The whole page you referred to is a mess. There're some floating references to L6 out there on the web (e.g., to Knight et al. 2003) but if you go to the original papers L6 is never there. "Again your example shows it's not necessarily the case. A degree is just a certificate that you have successfully completed certain studies..."
You should talk to my good friend Alvah Hicks at www.humanoriginssolved.com. This man has no degree either but at least he devoted his passion and knowledge of prehistory (as well as his "honesty with himself" and other qualities that are dear to your unschooled mind) on developing an out of America theory and was trying to explain the advantages of it to a host of stubborn academics back in the early-mid-1990s. Alvah and I came from absolutely different backgrounds on the opposite sides of the globe but arrived at the same conclusion. If you're an amateur, at least use your passion to develop something unorthodox. You, on the contrary, latch on ideas developed by some people with some degrees and add very little value. You should get a degree because in the very least you'll be forced to do some productive data collection. A doctorate or two are very important for the type of research we are trying to do. And I agree that one degree doesn't allow you to get at a full picture. That's why when you're relying on genetic papers written by people who have a Ph.D. in genetics and more specifically a Ph.D. in mtDNA genetics and more properly a Ph.D. in a locus genetics you're obviously going to have a very partial view. Or, if you are a Ph.D.-holding statistician and you're looking to apply your quant skill to to a social-scientific or biological field, you become a "population geneticist" with absolutely no knowledge of ethnology, archaeology or linguistics. You already have to write PNAS papers but you haven't even read enough about African segmentary lineages or click languages. All these specialized scholars are easily susceptible to ideas branded as "scientific" (out of Africa, the Anatolian origin of IE languages, the peopling of America from Asia, etc.) by their more powerful peers. The problem is that academic Ph.D.s are under an obligation to deliver against an organizational goal. Academic scientists are supposed to answer the question of where humans came from, teach 100 kids a day about it and then grade their papers all night, otherwise you and your Ph.D. students are not going to get paid. So, people use their hyperspecialized degrees to answer world questions and advance in their careers to protect these ideas. I'm lucky to sport two doctorates and one master's degree in different fields (four-field anthropology/ethnology, history, sociology, which are umbrella terms for lots of different sub-fields including linguistics and archaeology) and from different traditions. Genetics, physical anthropology, phylogenetics and evolutionary theory have been part of my curriculum on both lab and theoretical levels. You TALK more about archaeology and genetics - this is true - but your knowledge is rooted in compulsive belief, not in facts, logic, systemic thinking or good judgment. That's why, for the most part, it's irrelevant. I'm fully aware of the fact that out of America is a controversial idea, but I'm not going to waste my degrees on following ideas that haven't been developed with a full scientific rigor. I'm also keenly aware of the fact that there's very little data at our disposal to successfully answer the questions we want to have answers to. I'm sorry but in future I'm going to have to block comments that contain personal attacks and ad hominem arguments. And any other comments unrelated to issues raised on this blog. If you have a problem with this policy, please don't post it here, but send me an email. Thanks.